Over the last few days, two stories have broken which call into question one of the biggest companies in the PC games space's attitude towards smaller developers. Valve revealed over the weekend that it was changing the way that it handled revenue shares for bigger titles; where before it claimed a flat 30 per cent on game revenue no matter how much a project made or how many copies were sold, now the Steam firm's cut drops to 25 per cent once a title makes more than $10m. Furthermore, that drops to 20 per cent once revenue hits $50m. This incensed much of the indie games community who felt they were being short-changed by Valve. 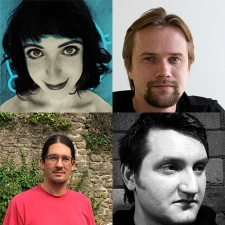 "I understand why Steam wants to move to secure its position with the bigger publishers, I just hope they don't also forget to help at the other end," Auroch Digital's Tomas Rawlings (pictured, bottom right), who has been outspoken about the negative impact Valve's changes have had on Steam. "For example raising the quality bar by upping the cost of platform access a little to dissuade shovelware and give indies some sunlight. Without considering both ends of the space, they'll inadvertently just increase the inequality of the platform for developers." Thomas Bidaux of Ico Partners (pictured, top right) adds: "The announcement has been received differently across the board in the industry. While the 30 per cent revenue share had been accepted as a norm, it is interesting to see that Valve making a change on this, but only for the higher grossing titles, is seen as a slap to the face for the smaller projects. Had they done nothing, nobody would be complaining - or at least no more than usual. "I find far more interesting to try to understand why the change, as not much has changed from an external point of view of Steam dominance of the PC gaming market, despite the release of two ambitious competitors through Kartridge and the Discord game store. An answer can be found in the Twitter thread from Adriaan de Jongh. Fortnite has become a major PC title, and it sits outside of the Steam ecosystem. Not only Fortnite is generating a lot of revenue, but it is also bringing a lot of new blood. Steam, as the historical platform, might be struggling to grow. The top grossing titles are generating enough revenue to consider striking on their own much more easily, and Fortnite has shown that it doesn't mean necessarily losing revenue, and it provides a degree of control on how you can promote your game that Steam doesn't allow.In my humble opinion, this is where Steam should open up further. Giving more tools for studios to understand how their marketing spend works when they drive their traffic to Steam. "I am very excited by another part of Valve's announcement though: studios can now safely share their numbers publicly if they wish to. This should make it possible to counterbalance the loss of precision on SteamSpy over time." Valve does care about indies as well: just the ones that get over a certain sales figure. Which is super tough on the smallest indies who've yet to see significant financial success from their games, but I don't think is indicative of Steam not caring about indies at all. The changes to the revenue share works was just one reason why indie developers were angry at Valve yesterday. The other - and arguably larger - source of anger was the reduced traffic that some smaller studios have seen recent months. Since the start of October, projects from indie firms has dropped, with many developers saying they think it's to do with another discoverability bug fix from that time which had an unintended side effect. The end result is clear though - fewer people are visiting the pages of these smaller titles. Discoverability has been an issue for indie developers for a while now, especially since Steam Direct launched in August 2017. Auroch's Rawlings has dubbed this phenomenon 'the Steampocalypse'. But now, smaller studios are being hit even harder with one developer - who wishes to remain anonymous - that their revenue has dipped by 75 per cent on Steam, while remaining "stable" on other platforms. "I compared full price sales before and after the October bug - being careful to avoid weeklong sales and Steam sales - and my units sold have halved. Revenue has dipped even more because our most expensive game has dropped to 36 per cent of previous unit sales," said Jake Birkett of Grey Alien (pictured above, bottom left), who is responsible for raising awareness of this issue via Twitter. "I'm not sure if this issue also affects traffic during a) discount sales and b) game launches because those are a lot harder to analyse like for like, but based on some data I've seen from other developers I'm suspicious that those things may also be impacted. "Also I've heard in private that some games are either not affected by this issue or have actually benefited from it with increased traffic! It stands to reason that if many devs are losing traffic, then that traffic must be going elsewhere. That said, a huge number of smaller indies have been hit hard by this issue, harder than me, with traffic and sales dropping to near zero in many cases." Lottie Bevan from Cultist Simulator studio Weather Factory (pictured above, top left) adds: "We're seeing a general downward trend - comparing our latest week of sales to two months ago, before the change Steam made, we're seeing around 40 per cent lower sales than normal. But it's hard to say if this is directly the result of an issue with Steam traffic, or if it's a general drop with an increasingly old news indie game + the freezing effect on indie revenue that is the run-up to Christmas. Because of fortunate timing with marketing/DLC releases or otherwise, we didn't see a sudden drop in revenue like other indies have reported, and, therefore, difficult to attribute current sales figures directly to a change on Steam's end." Many studios have emailed their Steam reps - or just Valve employees that they know - but at the time of writing, developers haven't heard back from the PC giant. With the changes to revenue sharing, and this new discoverability issue, we have to ask the developers we have spoken to whether, as indies, they feel valued by Valve as a company? "This is a tricky question. I have had some measure of success on the Steam platform and I've enjoyed going to Steam Dev Days and other events and talking to their reps who seem to be genuinely interested supporting indie developers," Birkett says. "So mostly I feel positive about the platform, but these discovery changes and the recent revenue share changes that are only relevant to hugely successful games don't make me feel particularly positive about the future of selling games on Steam. Making indie games is my full-time job and I'd really like it to continue for many years. I've had to adapt a lot over the years and it feels like another phase of adaption is approaching." Bevan adds: "We've actually always been treated well by Steam. We have a smart, engaged rep and have been fortunate enough to sell well enough that we're granted some extra visibility rounds and occasionally featured on the front page. I can't blame Valve for courting a massive triple-A publisher who can bring in more revenue than my indie studio's ever likely to do. "Valve seems interested in hedging their bets, and it has every reason to support indie hits as well as triple-A publishers: multiple indie hits attracting different audiences is a safer bet than one big triple-A game a year, for instance. Valve's key metric for whether they take an interest in you is of course how well you do - particularly defined by the infamous MMR you gain at launch. "But they've shown us with Cultist, and previously with Sunless Sea, that they do care about indies as well: just the ones that get over a certain sales figure. Which is super tough on the smallest indies who've yet to see significant financial success from their games, but I don't think is indicative of Steam not caring about indies at all." PCGamesInsider.biz has reached out to Valve for comment for this piece. There are also sponsorship opportunities available for the show. To find out more, please email [email protected].